This holiday season, we estimate that over 1/4 million of you received a Sierra 3-D Animated Adventure Game as a gift. To hear the people at the local telephone company talk about it, every single one of you called Sierra for an adventure game hint the day after Christmas. According to sources at the telephone company, Sierra hint calls not only clogged all the phone lines coming into Coarsegold and Oakhurst (a thriving metropolis of about 10,000) but was tying up telephone traffic as far away as Modesto and Sacramento (which are both more than 100 miles away). At peak hours, calls coming into Sierra were being turned back to their source at a rate of more than 1,000 an hour! … So forget I brought any of this up! What I was allowed to explain is how you can avoid becoming a member of Coarsegold, California's first telephone traffic jam, and get your hint without incurring the cost of a long distance phone call to our offices (which are a long distance call from anywhere!). So the rest of this article is about what to do if you've been stumped by a Sierra 3-D Animated Adventure Game and are ready to admit defea… I mean seek help in your quest. Of course everyone knows that a good computer user thoroughly reviews the documentation that comes with his software. (You do it, don't you? Sure you do!). But did you know that sometimes the box the product comes in can also provide hints on how to solve your game problem? As an example, the screen shots of the mermaid and the winged horse that appear in some editions of the King's Quest II packaging have provided thousands with the solutions to one of the adventure's biggest puzzles. 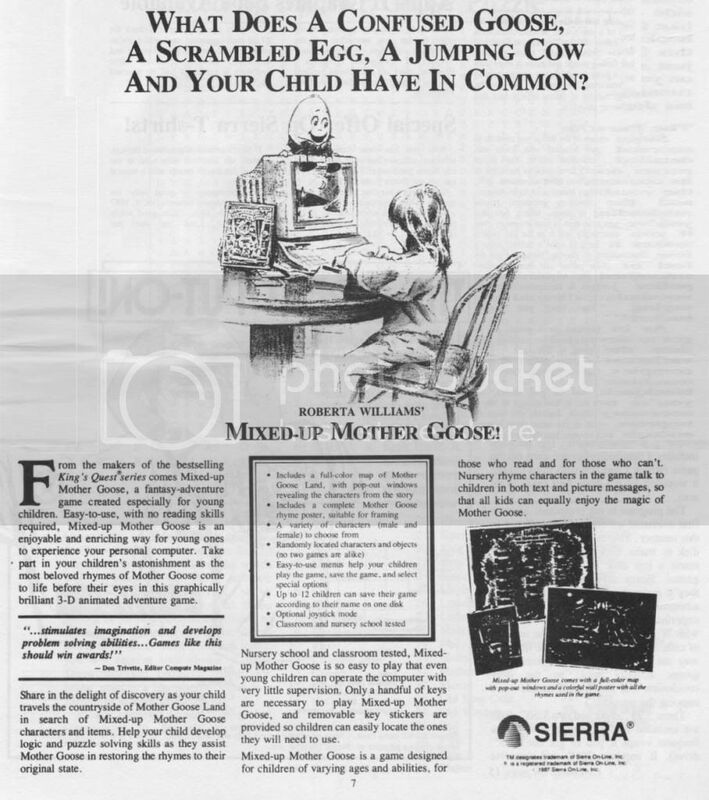 So remember to read everything that came with your adventure (including Sierra's product catalog). Sierra has sold over 100,000 units of almost every adventure game it offers (and over 1/4 million of a select few). Chances are, someone at your office or in your local user's group has played the same game your playing. If your a parent, ask your child for a hint! If your married, get your spouse's opinion on what you might do in your game situation. Do you really need to solve every game puzzle in the adventure in one sitting? If you're stuck in a situation, a good suggestion might be to save your game, and turn off your machine for a while. Forget about your problem and let your subconscious think about it. It's amazing how easy some solutions become when you really aren't trying to find the answer. For those of you not "in the know," Sierra offers hint books for all of its adventure games. Each hint book offers hints and game maps for adventure game players who get "stuck", and give each of the multiple solutions to be found in the game. The hints are written in invisible ink, with headings above them like "HOW TO GET RID OF THE SPIDER DROID." You uncover only those hints you want by using a special marker to reveal the hidden clues. At $7.95 each, hint books are much cheaper than long distance calls to Coarsegold, California and can be found in most software stores. If your local store doesn't have them, you can write to Sierra and order one. Yes, calling Sierra's BBS is a long distance call, and it will cost you money, but it's much easier to get through to Sierra over the bulletin board, which is open 24 hours a day, 7 days a week. All you need is a telephone, a computer and a Hayes-compatible modem. The number to the BBS is (209) 683-4463. Try it out. If you can't find a hint book, your friends can't help you, you don't have a modem and you're at the end of your wits, give us a call. Here are some suggestions on how to do it. SIERRA'S SUPPORT NUMBER IS (209) 683-6858. There are many phone numbers that ring into Sierra (sales lines, fax machines, administration lines, etc.) but only on the (209) 683-6858 phone number will you be able to receive hints. The business hours for Customer Support are 8 a.m. to 5 p.m. PST, and they only take phone calls Monday-Friday (weekends are spent catching up on the mail). Please do not call any of Sierra's 800 numbers when looking for a hint. These numbers are for orders and order tracking only, and hints are not given. When you call, have your product and documentation available, because you are likely to be asked a question about some packaging component. (For example, "What is the picture on page 17 of your manual?") We ask these questions to verify you own the product you are asking about (it's amazing how many people get pirated (stolen) copies of our game and still call us for customer support). If at all possible, be in front of your computer and facing your predicament. Sometimes our customer support people have to ask you questions about what is going on around you as you play the game. (For example, sometimes the pirate is in the tavern in King's Quest III, and sometimes he isn't.) If you can't be in front of your machine, try to take notes ahead of time so you can answer the questions we have. HAVE PATIENCE. As of this writing, Sierra has even hint lines open each day. Unfortunately, these lines do tend to get clogged during the afternoons, so you may have to call more than once to get through to us. For the best results, call us in the morning, right around 8 a.m. Avoid calling after 3 p.m. PST, when California students are out of school and our lines are busiest. If you absolutely can't get through to us on the hint hot line, don't own a modem, haven't got any friends that own computers, and can't bring yourself to buy a hint book, write us a quick letter. Tell us where you're stuck and what your current score is. Include in the letter itself (not just on the envelope) your return address and phone number. Sierra answers hundreds of "hint request" letters every day — so you should expect a speedy reply. To me, the real challenge of an adventure game has always been to conquer it without obtaining hints. But I know that our adventure games are also stories, and you want to know how they end. With that in mind, I offer good luck to you on your quests, and I invite you to give us a call in Customer Support if you get really stuck. We want to make your adventure game experience as enjoyable as possible.